Aside from sharing yesterday’s workout recap and mentioning that my new training plan starts today, I feel like we haven’t really chatted in a few days! It felt so good to finally go food shopping. I rushed out the door the other morning to Trader Joe’s to restock the house with some food essentials. When I say food essentials, I really mean coffee K Cups and watermelon. The rest of the food I could really take or leave at this point. Watermelon is a major food essential for me right now in the summer. It’s the only food that truly rehydrates me as a summer runner in this heat and humidity. Sure, adding sea salt to my oatmeal after I run works wonders but without watermelon, my thirst really can’t be quenched. My son came home from his teen tour Friday evening. One of the first things he said was that he has been following me on Instagram to see that I have been busy living the life. And by living the life, he means dining out a whole lot. We had the most wonderful dinner Thursday night at View in Oakdale. 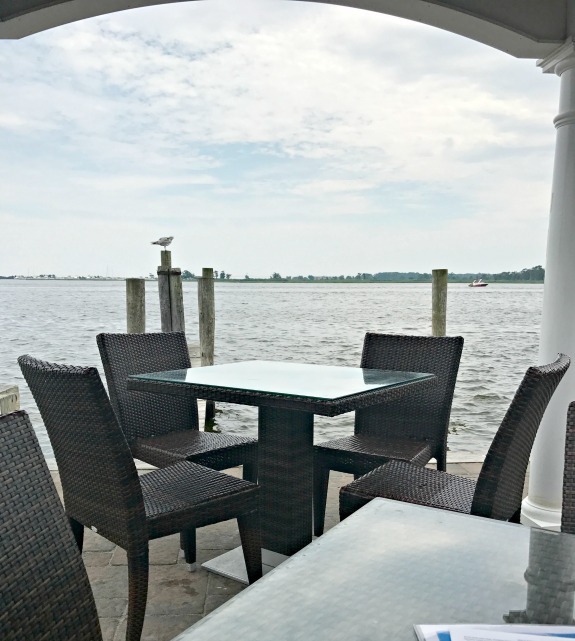 It’s all about outdoor dining on the water in the summer here on Long Island! I can’t wait to offer this Long Island outdoor dining spot a full review hopefully later this week. 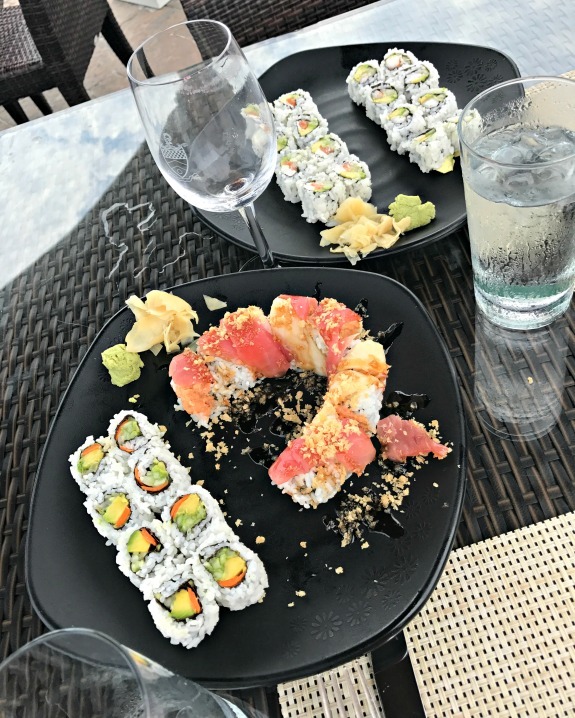 The sushi was terrific and it’s always fun when my son questions if the wine glass in pictures is mine. Who is the parent here is what I usually ask him! After a humid 10 mile run Saturday morning, I got ready super quick in order to get into the city to see Heather again! 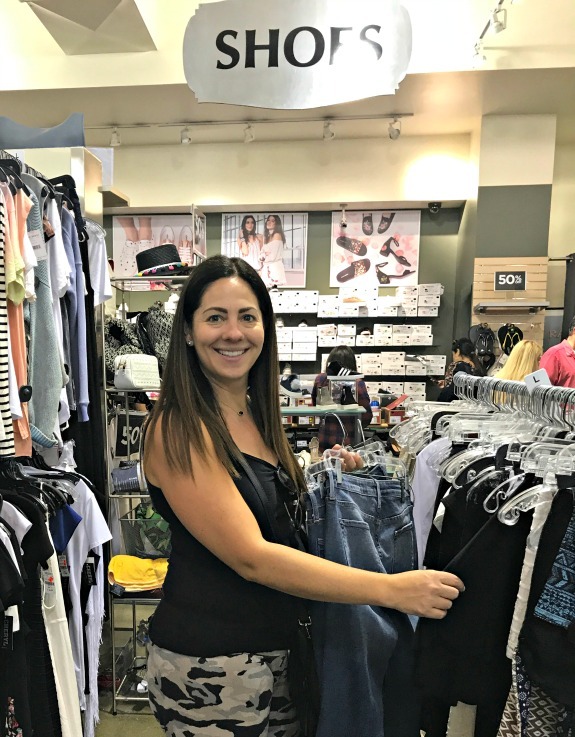 Her flight wasn’t until later in the afternoon so we had plenty of time to shop and eat before taking her to the airport. Shopping in the city has been our thing since we were old enough to walk around the city by ourselves. We picked a nice brunch spot on the upper east side (UVA) and got lucky to score the last open outdoor dining table. UVA has the fluffiest of pancakes on their brunch menu but I was STARVING and in the mood for savory food. 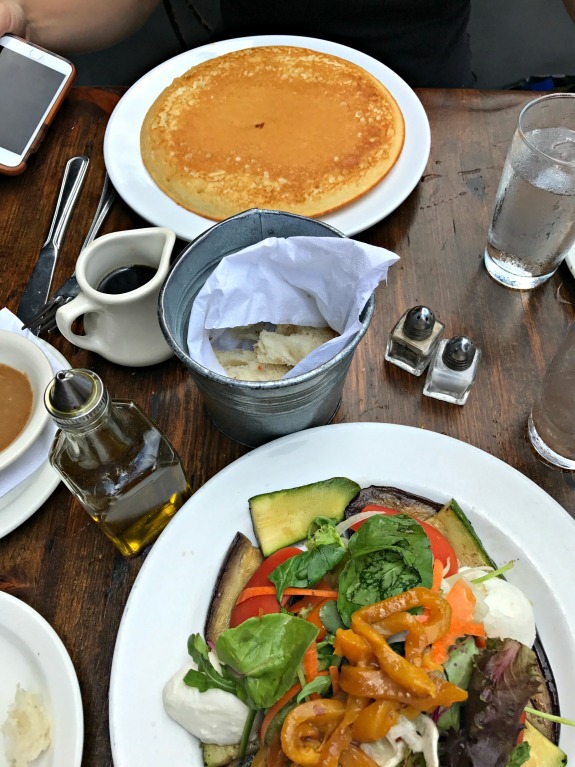 Heather did order the pancake though while I chose a grilled vegetable salad with fresh mozzarella. Did you know I don’t do Snapchat? Aside from my son telling me I am too old for it, I just can’t bring myself to do another social media platform. Between running the social media accounts for work plus the few I have for the blog plus my personal Facebook, I just can’t do it all. Heather on the other hand, she LOVES Snapchat. I appreciate the crazy videos and pictures she sends (or is it snaps?) to me and I guess I find this picture she took (snapped?) of us cute too. I spent most of yesterday doing laundry but I still made it to the mall and had my favorite Red Mango parfait for lunch. Major flashback post: Four years ago today Red Mango paid me to review their smoothie line! 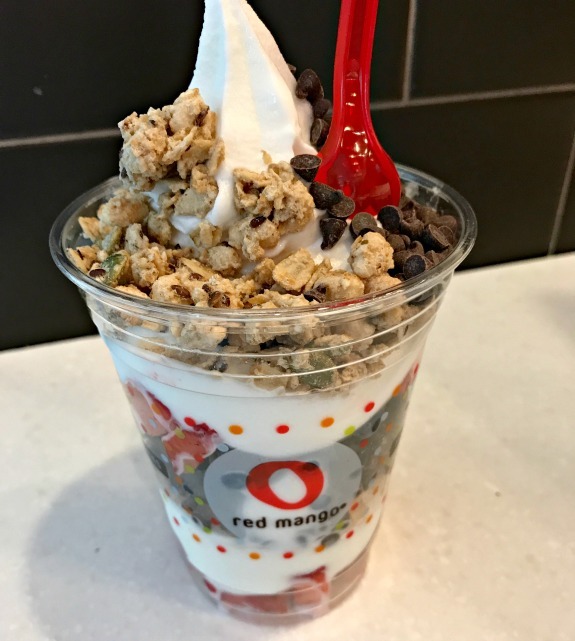 As a pretty new blogger at the time and devoted Red Mango lover, this was a really big deal for me! So while he thinks I am busy living the life, I remain jealous of the fun he is having this summer too. So far he has called the last two weeks, “the best two weeks of his entire life” which makes me so incredibly happy you don’t even know! 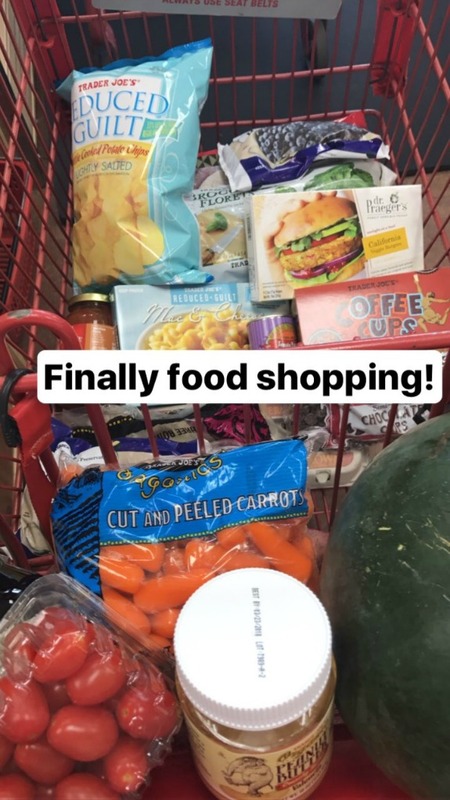 What are your food essentials right now when you go food shopping? Anything specific during the summer? How is your summer so far? Is it turning out to be one of your best you think? I love how happy you sound in your post! I can hear it through your words. Not that you’ve ever sounded unhappy–don’t get me wrong! You’ve just got an extra oomph lately. Okay so, I don’t do Snapchat either. And I don’t like most of the filters (except that one you have here which is really cute!!!) because my brain has a hard time processing them. I’m not really sure how to explain it. My sisters send me funny filtered videos of themselves all the time and my whole family loves it except me. I hate it! I never even watch the videos. Aren’t I a grump! Ha ha ha. Glad you guys had such a good weekend, and three cheers to a third best week ever of your son’s life! I LOVE IT! ha, I can’t process snapchat either! it’s way too much for my brain and I find it not necessary. how much social media stuff can we do? During the summer we love cherries, berries, peaches, and watermelon! And that outdoor dining spot looks beautiful. Sunday was SO refreshing here. I love going to church and then coming home, napping a bit, fellowshipping, singing, and praying with others. It’s so good! Sounds like you are having an amazing summer – and yay that your son is loving Teen Tour! I don’t do Snapchat either – I barely have enough focus for social media as it is. That grilled vegetable salad looks super delicious. the salad was awesome, I want to go back to that restaurant though when I’m in the mood for pancakes! I dont do snapchat and I really don’t get it! My coworker was telling me that her daughter uses it as a way to let people know what she is doing…like instead of texting to say I’m at the mall, she is send a snap a picture showing herself at the mall. I just don’t get it!! my son does that too with snapchat! I guess that’s how the kids operate today. I’m so happy to hear your son is having a blast.